When we talk of hygiene in the work place there is nothing more important than your communal toilet and restroom areas. Not only should the fixtures such as sinks, and urinals be spotless, but all surfaces including toilets also need to be clean to prevent the spread of flu viruses, germs and bacteria. Using the High Pressure Lance detail clean around the basin, taps, drain. 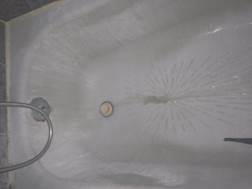 After steaming use a tissue to collect grime and dry. 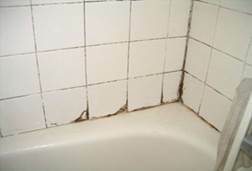 Normal cleaning can leave hard to reach areas untouched. Duplex® 180° 8 Bar Steam cleaning can blast beneath tight areas and effectively clean and sanitize with the superheated and 8 Bar pressure. It can easily sanitize the toilet area from top to bottom without harmful chemicals. For below accident ( normally caused by extreme strong acid or alkali ), contact us for an estimate! 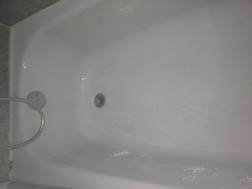 Despite how relaxing a bath can be, there is something quite unsettling about tubs. At any given time, thousands of germs may have made their home there. And while you may think this is an exaggeration, studies have shown that bacteria like E. coli and streptococcus thrive in warm wet environments. I don’t know about you, but the idea of sitting in a bathtub with bacteria is just gross. 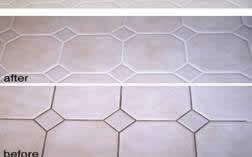 When cleaning grout lines with a JetSteam Maxi steam cleaner , use a 'Pressure Lance' with the nylon detailing brush. The Pressure Lance provides a jet of high pressure concentrated steam and the brush is used to lightly agitate the grime. As steam does most of the work the Pressure Lance with detailing brush only needs to lightly contact the grout line and there is no need for heavy scrubbing like the old toothbrush method. inside the mattress, sofa, pillows etc. 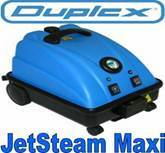 Duplex® 180° 8 Bar Steaming ( Dust mites,bed bugs and bacteria killing ) The Steam Vapor molecules are smaller and hotter than regular steam. These Steam vapors penetrate deeper, and clean and sanitize better. This very highly heated steam is 94% dry; leaving little moisture after cleaning. It kills dust mites, bed bugs, and all other pathogens instantly. Extremely SAFE to use, and uses NO CHEMICALS. The JetSteam Maxi uses +170ºC to +190ºC superheated 94% dry steam and 8 bar pressure to emulsify soiling, thermally decontaminate and breakdown odours. Our supersteamers do not produce just steam, but supersteam. Supersteam is superheated, dry and consistent steam that cleans better than normal steam. It can penetrate deep into your bedding and kills all contaminates instantly on contact and then is extracted out. You now have a Safe and Healthy mattress for You, Your Family, and Your Guests to sleep on...and Peace Of Mind!